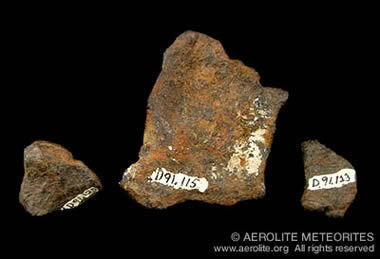 Nininger Iron Meteorites: Three small iron meteorites which carry hand painted H.H. Nininger American Meteorite Laboratory collection numbers. We know from old AML publications that "D91" was Nininger's prefix for the Odessa, Texas iron meteorite. So, the middle piece is the 115th Odessa specimen cataloged by Dr. Nininger. Meteorites with vintage hand painted numbers are very desirable, and these specimens are much more valuable to collectors than a comparable Odessa which does not have an historic provenance. Photograph by Leigh Anne DelRay, copyright Aerolite Meteorites. Click to enlarge. 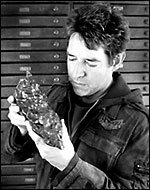 When I was a little boy growing up in England in the late 1960s, my greatest treat was traveling up to London’s marvelous Geological Museum (now part of the Natural History Museum, London) to visit their mineral and meteorite collections. At that time nearly all known meteorites were housed in universities and museums and private ownership was not commonplace. The pioneering American meteorite scientist Harvey H. Nininger opened his Meteorite Museum next to Route 66 in Arizona in 1946 and was one of the first people to start offering meteorite specimens for sale to the public. A few of the natural history supply companies such as Ward's Natural Science were also a source for meteorite specimens but, for the most part, space rocks were the domain of academia and a few eccentric collectors. 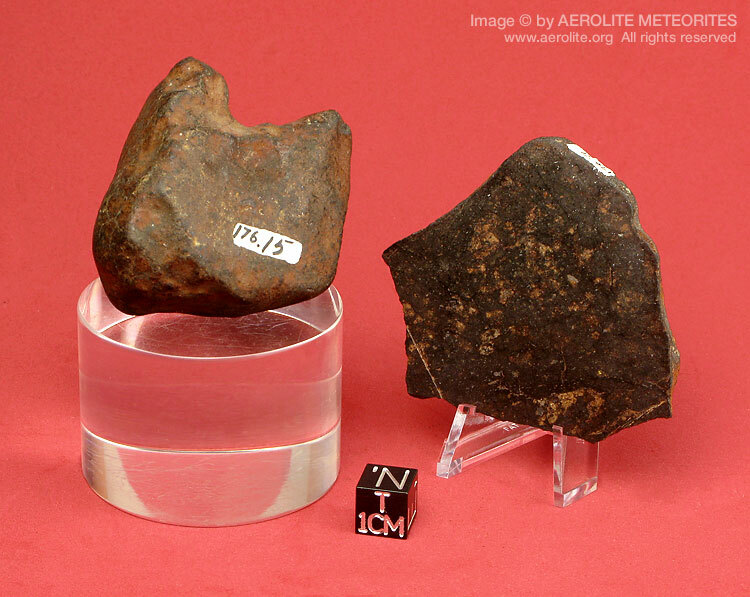 During the 1970s and early '80s bold enthusiasts such as Robert Haag, Allan Langheinrich, Marvin Kilgore, Blaine Reed and Edwin Thompson began turning their passion for space rocks into legitimate businesses and the modern world of meteorite collecting was born. In the pre-Internet days, with no popular print publication aimed at the budding space rock collector, it was difficult to meet fellow enthusiasts. The magazines Astronomy and Sky & Telescope would occasionally publish articles on meteorites; sometimes a small ad for "Meteorites" could be found among the back pages of those publications and the early dealers mailed out newsletters and handmade catalogs to their small customer bases. Today, space rocks are readily available from many different outlets and the quarterly Meteorite magazine caters to the space rock enthusiast, as does the monthly online publication Meteorite Times and the Meteorite Mailing List (online listserve). There are a number of people, like myself, who work with meteorites full time, and a multitude of collector/dealers who operate part time meteorite-related businesses in order to help underwrite the cost of expanding their own personal collections. 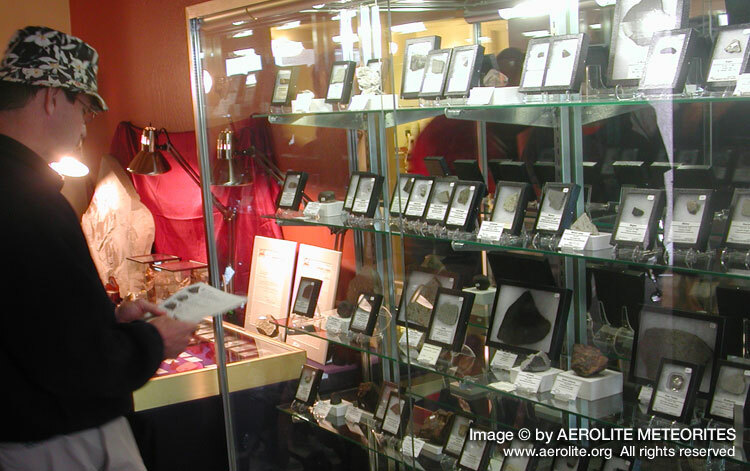 Meteorite exhibit at a gem show: Collectors enjoy a display of rare and historic meteorite specimens at the R.A. Langheinrich Meteorites showroom during the annual Tucson gem and mineral showcases. Collectors and dealers flock to Tucson, AZ every February to buy, sell, and trade space rocks. The Tucson gem show is the largest in the world, and offers all types of natural history collectibles including fossils, minerals, and gemstones. Photograph by Geoffrey Notkin, copyright Aerolite Meteorites. Click to enlarge. Half slice of a pallasite meteorite: A 67.9-gram half slice of the Imilac pallasite from Chile's Atacama Desert. 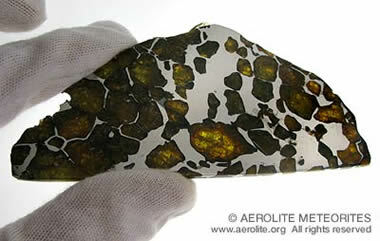 This meteorite has been sectioned and polished to reveal beautiful translucent olivine crystals. Pallasites are believed to have formed at the core/mantle boundary of large asteroids and are among the most sought after of meteorite collectibles. Imilac is a particularly stable pallasite and examples such as this one, with clear and colorful crystals, are highly prized by collectors. Photograph by Leigh Anne DelRay, copyright Aerolite Meteorites. Click to enlarge. As is the case with most collectibles, the commercial value of a meteorite is determined by a number of factors including rarity of type, provenance, condition of preservation, and beauty or aesthetic appeal. It is important to note that new and noteworthy meteorite finds should always be made available to the scientific community for study. 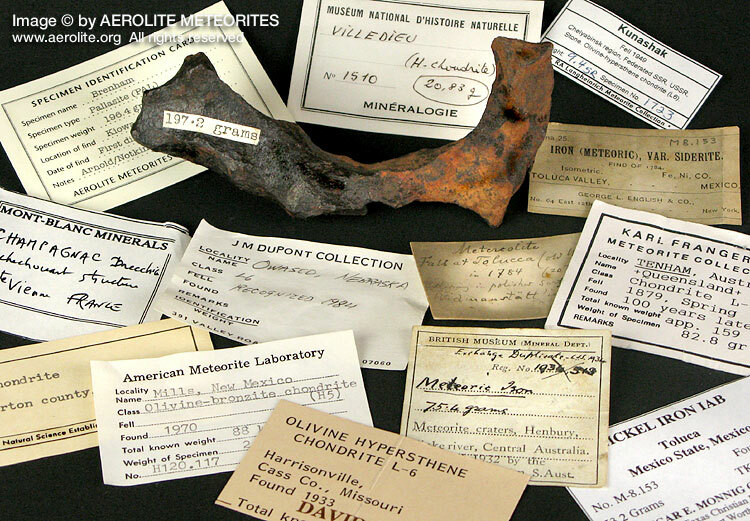 Once a meteorite has been analyzed and classified by academia, surplus specimens find their way onto the commercial market. The process of acceptance into the official scientific literature actually adds commercial value to a meteorite. Meteorite prices vary from one source to another but the numbers quoted here are typical of retail values in today’s marketplace. Unclassified stone chondrites picked up by nomads wandering in the Sahara Deserts are readily available for about $0.50/gram. Attractive stones from the Gao-Guenie witnessed fall (Burkina Faso, Africa, March 5, 1960) can be purchased for about $1.50/gram and a top quality one-kilogram specimen of the Campo del Cielo iron meteorite from Chaco Province, Argentina can be yours for about $400. The Russian iron Sikhote-Alin (fell February 12, 1947) is the largest single meteorite event in modern recorded history and individuals — meteorite specimens which landed as one intact piece, rather than exploding on or near the ground — are coveted by collectors because of their marvelous sculptural qualities and surface features. A premium Sikhote-Alin specimen will carry a price tag of $2 to $3/gram. Pallasites are stony-iron meteorites packed with olivine (the gemstone peridot) and are particularly desirable when cut and polished because of the alluring color and translucency of the crystals they contain. Prepared slices of stable pallasites such as Imilac (Chile), Glorieta Mountain (New Mexico, USA) and Esquel (Argentina) are prized for their colorful gemstones and long-term stability, and will fetch between $20 and $40/gram. Meteorites are heavy, so a quality slice the size of a small dinner plate is worth thousands of dollars. At the high end of the pricing scale are unusual types such as the diogenite Tatahouine (fell June 27, 1931, Foum Tatahouine, Tunisia). A prime specimen will easily fetch $50/gram while rare examples of lunar and Martian meteorites may sell for $1,000/gram or more — almost forty times the current price of gold! 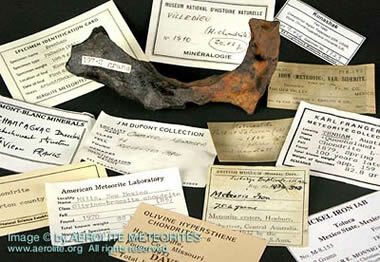 Meteorite with historic labels: A 197.2-gram Henbury iron found in Australia in the mid-1930s, surrounded by a collection of specimen ID cards and museum labels. This particular Henbury was acquired in an institutional trade with the Natural History Museum, London, and it was also featured in a scientific paper published during the '30s. Such an unusual provenance adds considerable value to what is already a very appealing sculptural piece. The ID cards pictured are from some of the most prominent museums and collections in the world, including the Museum National D'Histoire Naturelle (Paris), The Oscar E. Monnig Meteorite Collection (Fort Worth, Texas), The British Museum, and the American Meteorite Laboratory. 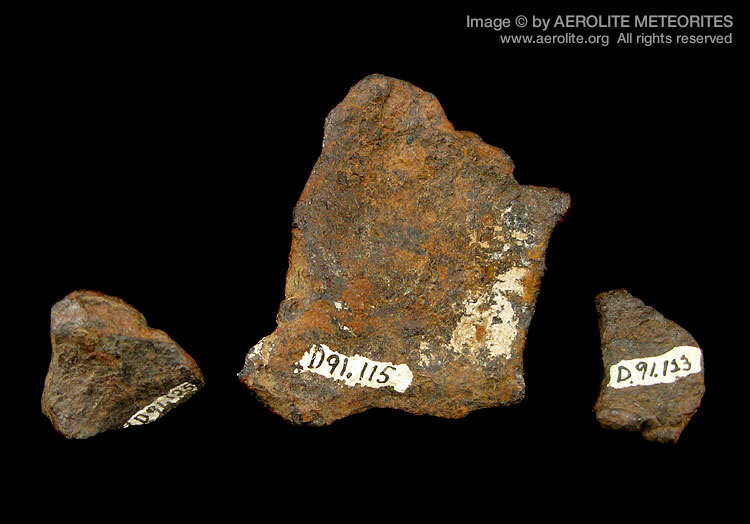 Historic labels such as these greatly increase the value of the meteorite specimens they accompany. Photograph by Leigh Anne DelRay, copyright Aerolite Meteorites. Click to enlarge. Some collectors are drawn to otherwise ordinary meteorites that have an intriguing history, such as the Beaver L5 chondrite — used as a doorstop in the Beaver County, Oklahoma jail during the 1940s — or the Claxton L5 chondrite which demolished a mailbox in Evans County, Georgia during the winter of 1984. Specimens that carry a unique provenance are also highly sought after by collectors, as they provide a link to the enthusiasts who have gone before us. Harvey Nininger and his successor, Glenn Huss, painted small, meticulous collection numbers on their specimens, which were accompanied by American Meteorite Laboratory specimen cards. A relatively common meteorite such as the Canyon Diablo iron (Arizona, USA) becomes highly collectible if it carries a Nininger number. Major museums with extensive collections sometimes trade with meteorite dealers and hunters, in order to acquire new material. A specimen with a label or number from the American Museum of Natural History in New York, or the Natural History Museum, London, for example, increases dramatically in monetary value as its terrestrial history travels with the specimen in the form of official documentation. I know collectors who have paid hundreds of dollars for an otherwise unexceptional specimen purely because it came with a vintage handwritten label of great historic interest. Meteorites in Riker mounts: Collectors often display slices and small, valuable individual meteorites in glass topped boxes known as Riker mounts. Pictured (top left) is a slice of impact breccia (terrestrial rock deformed by a massive meteorite impact) which I collected inside the Popigai meteorite crater during our 1999 expedition to northern Siberia, and (top right) a Wiluna stone meteorite (H5 witnessed fall September 2, 1967, Western Australia) with a hand painted Australian museum collection number. 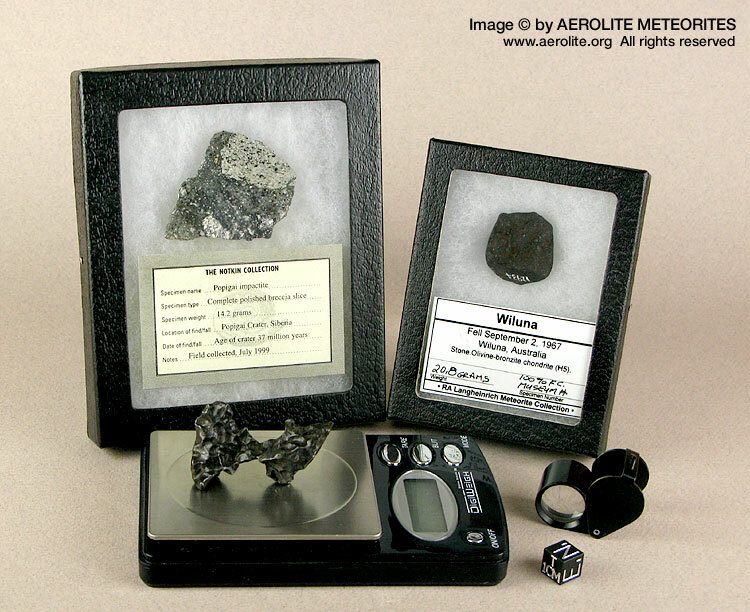 As meteorites are sold by weight, collectors and dealers often travel to gem shows with a portable digital scale and a loupe for examining specimens. 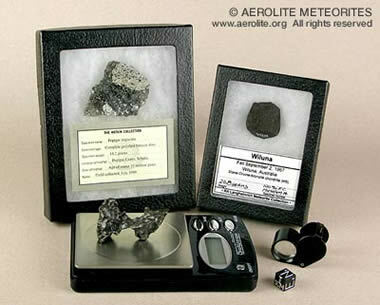 A 1-cm cube is used by scientists and professional dealers to show scale when photographing meteorite specimens. Photograph by Leigh Anne DelRay, copyright Aerolite Meteorites. Click to enlarge. Meteorites that are seen to fall by credible observers are known as witnessed falls, while those that are discovered later, by chance, are known as finds. Witnessed falls typically command higher prices than finds, and some meteorite collectors make a personal quest of acquiring an example of a meteorite that fell on their actual birthday. It’s not always an easy task. A single stone which fell in the western US on my birthday is locked up in a major museum collection and I may never be able to get a piece, though I do hold out some hope! The famous Peekskill meteorite is an ordinary chondrite (H6) with no special scientific interest, but a great example of how a remarkable story can add value to an otherwise unremarkable meteorite. The fact that the 12.4-kg Peekskill stone pummelled the trunk of a parked 1980 Chevy Malibu on the night of October 9, 1992 makes it one of the most desirable specimens for collectors of witnessed falls. While you could easily purchase another H6 chondrite for $1/gram or less, a specimen of Peekskill will cost $100 to $200/gram if you can find somebody willing to part with a piece. 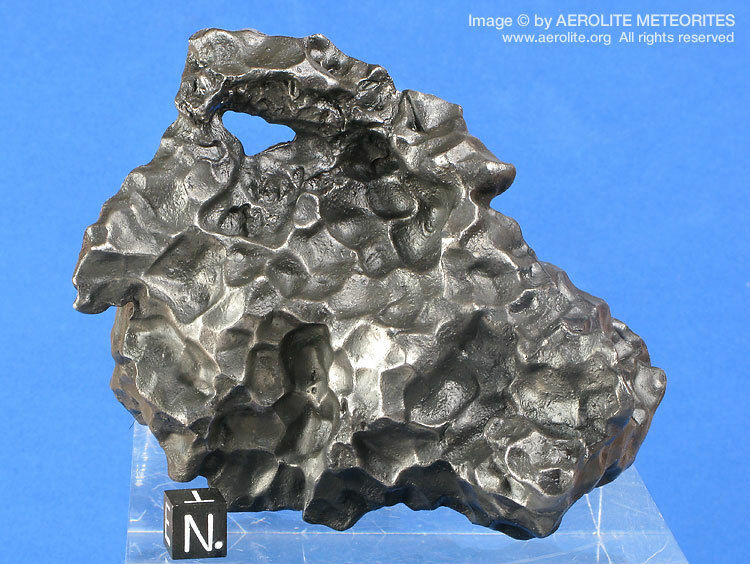 If you would like to learn about meteorite identification, and discover how to perform some simple tests at home, please visit The Aerolite Guide to Meteorite Identification. Meteorites are very valuable both to the scientific community and to enthusiastic collectors. So, if you think one landed in your backyard, be sure to get it checked out! Some collectors, like myself, are drawn to aesthetically beautiful irons that have been forged by the elements during their fiery plunge toward our planet. Melting in our atmosphere can mould meteorites, particularly irons, into fantastic sculptural shapes. They may acquire features particular to meteorites such as regmaglypts (thumbprints), orientation, flow lines, fusion crust, and in very rare cases natural holes. Meteorites displaying good examples of some or all of these features command a premium price on the collectors’ market. Sikhote-Alin meteorite with a hole: A magnificent 1,315-gram complete iron meteorite from the Sikhote-Alin witnessed fall of 1947. This outstanding aesthetic specimen is partially oriented, covered with fine regmaglypts (thumbprints) and displays an extremely rare large natural hole. Fewer than one in a thousand iron meteorites have naturally-occurring holes, and a meteorite of this quality would make a fine centerpiece in a major collection. Photograph by Geoffrey Notkin, copyright Aerolite Meteorites. Click to enlarge. Complete individual and full slice: A popular collecting strategy among enthusiasts is to acquire both a complete individual and a full slice from the same meteorite. In this way both the interior and exterior features of a particular meteorite can be displayed within the same collection. Pictured here are a complete individual, 133.8 grams with hand painted H.H. Nininger number 176.15, along with a full polished slice, 39.0 grams with Nininger number 176.71, of the Harrisonville meteorite. This L6 veined chondrite was found in Cass County, Missouri in 1933. Photograph by Geoffrey Notkin, copyright Aerolite Meteorites. Click to enlarge. There are almost as many ways to collect as there are different meteorites. I have a good friend who only owns oriented meteorites; another whose entire collection consists of meteorites he has found himself. A colleague of mine in Phoenix specializes in meteorites from our home state of Arizona and another friend in Denver has a marvelous assortment of small perfectly fusion crusted individuals. Others collect only witnessed falls, micro mounts (small part slices in display boxes), thin sections, or pallasites. Type collectors attempt to acquire one representative example of every known petrologic type — a formidable task! The new collector may wish to start by obtaining one specimen from each of the three main meteorite groups: irons, stones, and stony-irons. “Classic” irons such as Sikhote-Alin, Canyon Diablo, Odessa (Ector County, TX, USA), Henbury (Australia), are represented in most large collections and are all relatively affordable. Stones such as Gao-Guenie, Gold Basin (Mohave County, AZ, USA) and Northwest Africa (NWA) 869 — a beautiful brecciated chondrite from the Sahara Desert — have been found in great numbers and modest sized specimens can easily be purchased for $50 to $100. Stony-irons, which include mesosiderites and pallasites are the rarest of the three main classes, but the Chilean mesosiderite Vaca Muerta and the Russian pallasite Seymchan are available at reasonable prices. The more advanced collector may begin purchasing slices (sections) in order to show the interior structure of meteorites. The Gibeon (Namibia) iron is very stable after cutting, displays a beautiful crystalline pattern when etched with a mild solution of nitric acid, and is a favorite among enthusiasts. After a few years, most aficionados tend to develop an area of special interest and concentrate on collecting those meteorites that hold a particular fascination for them. Explore the field, see what is available, talk to dealers and collectors, and do your research. There are several good books that will help you learn about meteorites and meteorite collecting and I particularly recommend The Field Guide to Meteors and Meteorites by O. Richard Norton and Lawrence A. Chitwood, and The Art of Collecting Meteorites by Kevin Kichinka. A Google search for the phrase “meteorites for sale,” at the time of writing, produced 91,300 returns, so there is plenty of choice out there in cyberspace. My most important piece of advice to all collectors, particularly novices, is this: know your source! Meteorites are expensive and maintaining a good reputation as an honest dealer is vital in our business. Many high value specimens are sold in extremely small part slices, particularly lunar and Martian meteorites. A sub-gram fragment of a shergottite from the planet Mars may look uncomfortably similar to a blob of cement, so it is critical to know that you are purchasing from a reputable source. There are plenty of fake and misrepresented meteorites out there, particularly on eBay, so always purchase from an established and experienced dealer who will stand behind the authenticity of his or her merchandise. It can be amusing and slightly disconcerting to browse the meteorite lots on eBay. It seems that every other offering is described as “awesome,” “simply the best,” or “museum quality!” True museum grade specimens are few and far between, so don’t believe everything you read in auction listings. That being said, eBay can be a good place to build a collection of inexpensive meteorites but, I’ll say it again, make sure you are purchasing from a vendor with a solid reputation. The International Meteorite Collector’s Association (IMCA) is dedicated to maintaining high standards of integrity within the meteorite marketplace, and members display the IMCA logo on their websites. As a condition of membership IMCA dealers must stand behind the authenticity of every piece they sell, so working with an IMCA-affiliated seller can be a good first step. There are more meteorites available for sale today than at any time in history, so now is a great time to start your own personal collection of space rocks. Geoffrey Notkin, co-host of the Meteorite Men television series and author of Meteorwritings on Geology.com, has written an illustrated guide to recovering, identifying and understanding meteorites. Meteorite Hunting: How to Find Treasure From Space is a 6" x 9" paper back with 83 pages of information and photos. Geoffrey Notkin is a meteorite hunter, science writer, photographer, and musician. He was born in New York City, raised in London, England, and now makes his home in the Sonoran Desert in Arizona. A frequent contributor to science and art magazines, his work has appeared in Reader's Digest, The Village Voice, Wired, Meteorite, Seed, Sky & Telescope, Rock & Gem, Lapidary Journal, Geotimes, New York Press, and numerous other national and international publications. He works regularly in television and has made documentaries for The Discovery Channel, BBC, PBS, History Channel, National Geographic, A&E, and the Travel Channel.